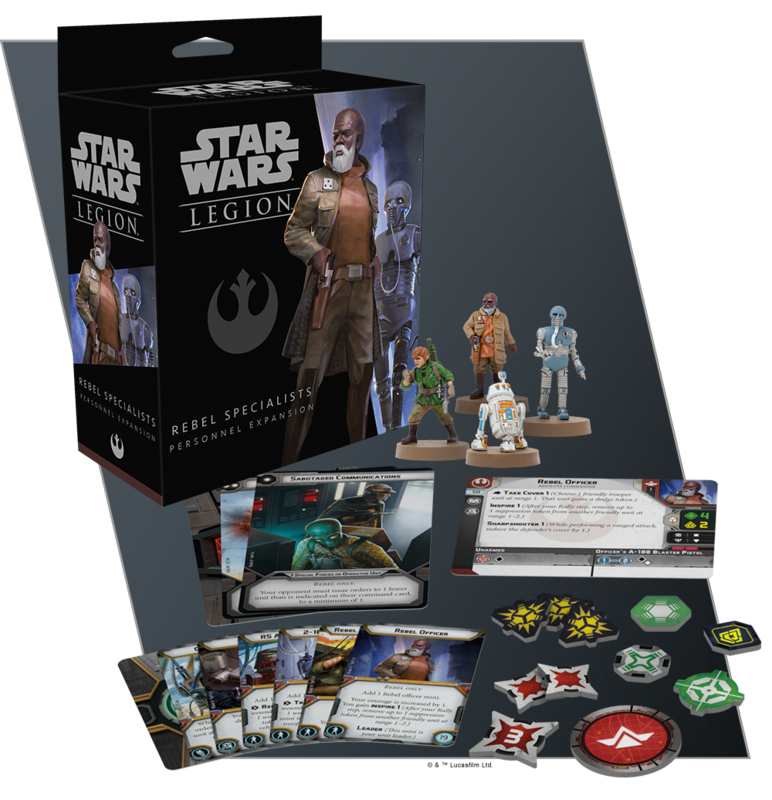 Fantasy Flight Games is happy to announce the Rebel Specialists Personnel Expansion and the Imperial Specialists Personnel Expansion for Star Wars™: Legion! Order your own copy of these expansion packs at your local retailer or online through our website today! Armies are more than just soldiers. To wage an effective war across the countless planets of the Star Wars galaxy, both the Rebel Alliance and the Galactic Empire need recruits who can do more than fight. In the chaotic battles of the Galactic Civil War, soldiers who can facilitate communications, keep their troops and vehicles in the fight as long as possible, and effectively lead every part of their army into the thick of the battle are just as valuable as the rank-and-file. These supporting troops keep armies up and running, and now, they’re making their ways to the battlefields of Star Wars: Legion. In each of these expansions, you’ll find everything you need to incorporate these specialists into your Star Wars: Legion units. 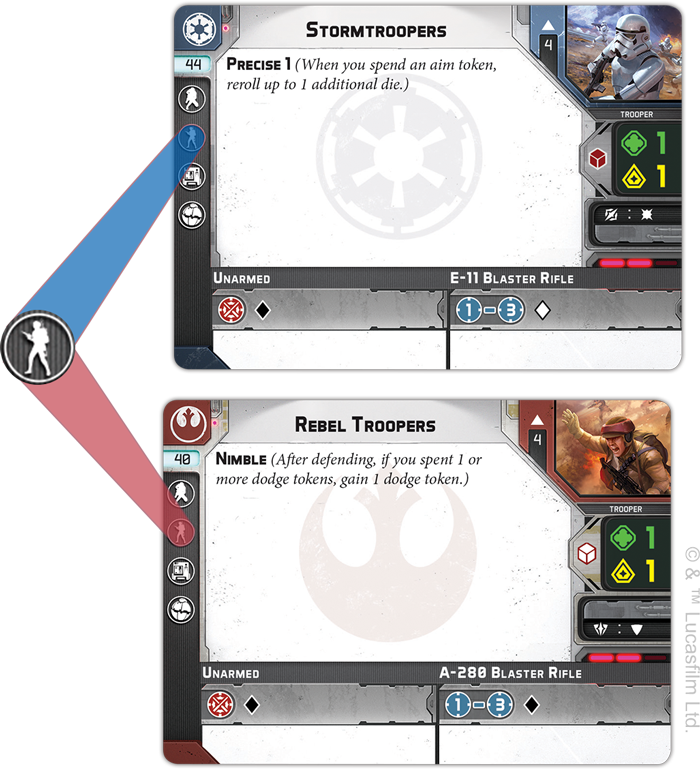 Four finely sculpted specialist miniatures, including an officer, a comms specialist, a medical droid, and an astromech droid stand ready to support your units, while three new command cards give you the chance to further hone your battle plan and plot your strategies. Finally, an array of upgrade cards let you further customize your units, turning them into crack teams of soldiers. Releasing in the first quarter of 2019, these two expansions open up new possibilities for your Star Wars: Legion armies! Both the Rebellion and the Empire are fortunate enough to have their share of powerful leaders. 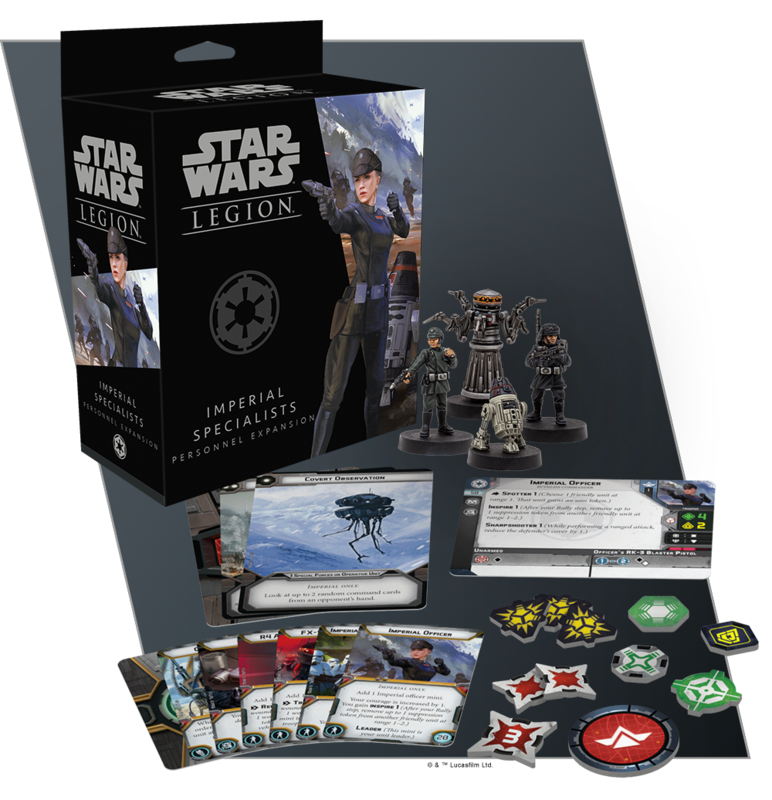 No matter if their troops are led into battle by the inspiring presence of Leia Organa or terrified into performing their best by the intimidating Darth Vader, each faction’s commanders bring their own style to the battles of Star Wars: Legion, shaping the flow of battle with unique abilities and signature command cards. But the Galactic Civil War rages across many worlds, and these commanders cannot be present at every battle. In those cases, both Rebellion and Empire rely on their veteran officers to implement their battle plan and seize victory. Appropriately, then, both personnel expansions give you an alternative to these more well-known heroes in the form of non-unique Rebel and Imperial officers. Not as widely celebrated as other commanders, these officers contribute to the cause nonetheless, making your armies more flexible with their ability to be deployed in two different ways. On one hand, these minis can be added to a specific unit as its leader, inspiring the troops in that unit to new heights. On the other hand, these officers can take on a larger role, becoming a cheap alternative to your other commanders. In this case, they can benefit your entire army by filling the role of commander, spotting targets for your other units or helping them take cover. Regardless of how you use them on the battlefield, the officers in both personnel expansions are accompanied by three new command cards that can be used by any commander in their faction. A good commander needs to coordinate with all their troops and, appropriately enough, these cards let you issue orders to any type of unit, ensuring that the right unit is ready to go exactly when you need them and letting you tailor your strategies to specific units in your army. 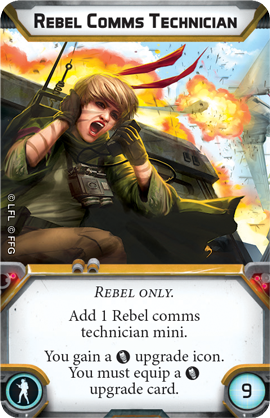 We’ll take a closer look at both the Rebel and Imperial officers and their command cards in future previews! Officers on both sides of the conflict oversaw many of the unsung battles of the Galactic Civil War, working alongside their troops to capture objectives and secure victory. But they are far from the only troops to take on a specialized role within their units. Many Star Wars: Legion units, such as Rebel Troopers and Stormtroopers, feature the personnel icon in their upgrade bar. Thus far, these spots have been reserved for adding extra figures of the same type to these units, adding extra dice to their attack pool and making the unit a bit heartier. Any unit with the Personnel upgrade icon can add one of these specialists! 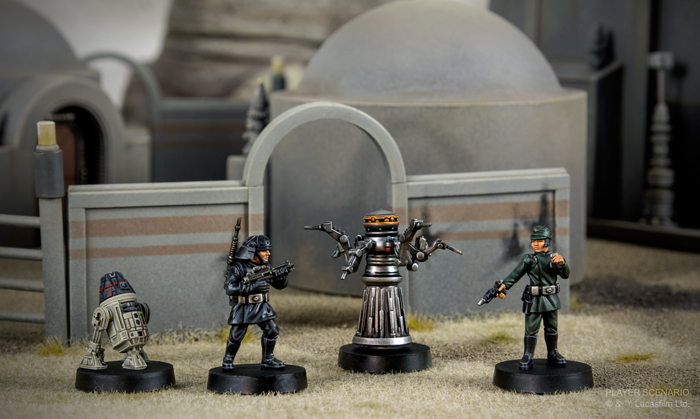 With the miniatures included in these personnel expansions, however, you suddenly have more options for customizing your units and enhancing the effectiveness of your army. 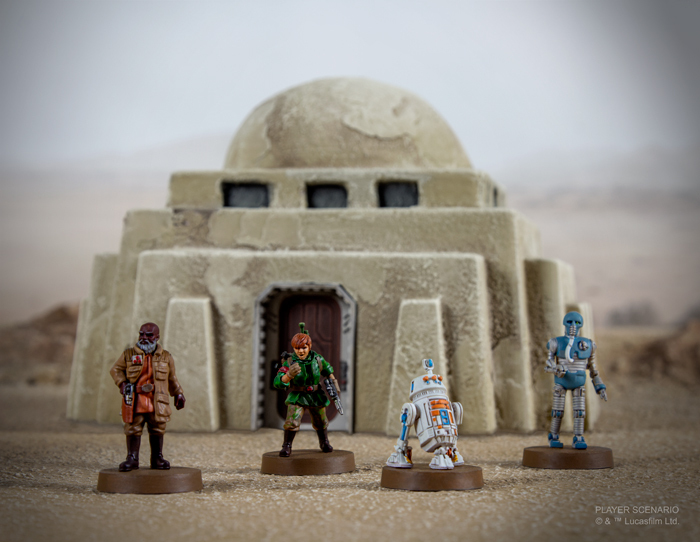 Each miniature supports your units in a different way and can give even the most basic trooper squad a purpose beyond blasting away at enemy forces. For example, assigning a Rebel Comms Technician to a unit of Rebel Troopers adds a comms upgrade, potentially making this unit a linchpin of your strategy, receiving orders from the far side of the battlefield, relaying orders to other units, or even jamming enemy transmissions. We’ll take a closer look at the other miniatures in these expansions, including all of their upgrade cards, in future previews! Armies that operate efficiently and effectively rarely taste defeat, and with the Rebel and Imperial specialists on your side, you can be sure that your troops will be at their best. 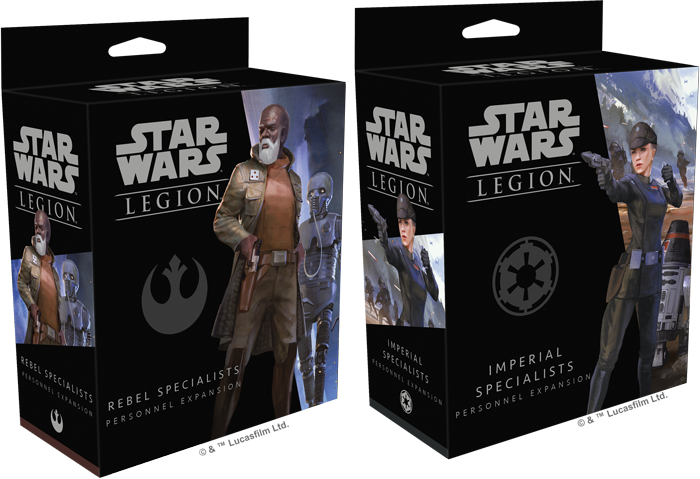 Look for the Rebel Specialists Personnel Expansion (SWL26) to release alongside the Imperial Specialists Personnel Expansion (SWL27) in the first quarter of 2019. Pre-order your copies of these expansions at your local retailer or online through our webstore today!